Members of the Shade and Woodland Plants Group are a community of gardeners with a special interest in plants adapted to grow in these conditions. Most gardens have shade, whether under trees or in areas overshadowed by walls or buildings. The ground may vary greatly from soil that is rich and moisture retentive to that which is poor and dry. Here, perhaps more than in other areas, we need to put the right plant in the right place to ensure a good display. With members scattered across the UK and abroad, the Group aims to establish an exchange of information and advice about growing shade tolerant plants and from this create a web-based archive available to the public. The Shade and Woodland Plants Group holds an Annual Meeting and AGM. The venue will vary each year to ensure all members have an opportunity to attend. Excellent nurseries, Plant Finder and mail order combine to make it much easier to source rare and unusual shade loving and woodland plants than it used to be. In some cases however, plants just are not available commercially and are often out of stock even when listed in the Plant Finder. Our plant exchange is meant to help with such cases. More information about the shade and woodland plant exchange. Firstly there are many woodland plants for which germination is much more successful if they are planted as soon as possible after collection (Epimedium, Trillium etc.). We need a process which gets these from the donor to the planter much more quickly than the main distribution scheme can achieve; Secondly the seed of several woodland plants ripen either very early in the year (spring ephemerals) or much later than the seed distribution cut off (Kirengeshoma, Disporopsis etc.) although these are distributed by the main scheme, they are automatically quite old before they get planted. Finally many woodland plants produce seed in very small quantities. We would like to ensure that this goes to shade enthusiasts who stand the best chance of germinating and successfully growing the plants. Our e-newsletter, Shade Monthly, is sent to all members of the Shade and Woodland Plants Group and each edition will then be made available on the HPS Blogs page 3 months later. 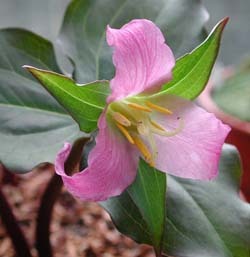 Membership of the Shade and Woodland Plants Group is open to all Hardy Plant Society members. Overseas members: £7 p.a. (£8 joint), or £20 (£23 joint) for three years. Payments can only be accepted in sterling. Postal application Please download and complete the Application form (pdf file) and send it with a cheque payable to ‘HPS Shade and Woodland Plants Group’ to the Membership Secretary at the address given on the form. Payment by Standing Order You may wish to complete the Standing Order Form (pdf file) so that your annual subscription is paid on 1st January annually. This simplifies the administration of subscriptions and many HPS members already do this for their national subscription.